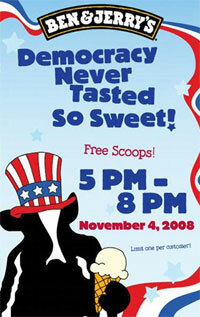 Ben & Jerry's is rewarding you for voting on Tuesday with a free scoop of ice cream at their stores. On the evening of November 4th, from 5 – 8 pm, Ben & Jerry’s ice cream Scoop Shops will be giving away free scoops across the nation. “Originally, we planned to give free scoops away just to those who voted. We found out afterwards that certain laws may not allow it. So instead we’re celebrating our election with a national party,” said Walt Freese, Chief Euphoria Officer of the Vermont based ice-cream maker. “Democracy never tasted so sweet,” added Freese summing up the effort. Evidently Krispy Kreme isn't as concerned about the legalities of offering freebies only to those who have voted.